Add a spirit of nautical adventure to your life with outdoor sailboat decor, whether you're a regatta spectator or as adventurous as Joshua Slocum. Add sailboat accents to your outdoor living space, and you just may find your imagination sweeping along a peaceful waterway on a beautiful day, propelled by a gentle breeze. 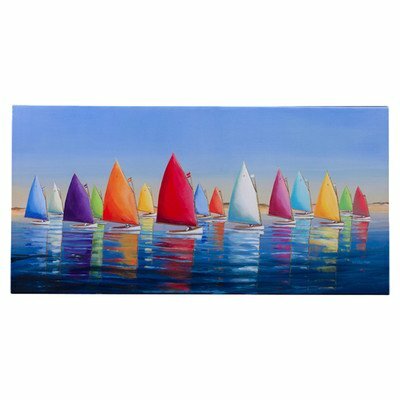 Whether you already have a nautical or coastal decor in your home, or just want to add a pretty touch to your yard, sailboat themed pieces are the perfect choice. Let your adventurous spirit take wing as you sit on your patio, planning an afternoon of watching white sails against a blue sky, or dreaming of sailing around the world in a sloop named Spray. Why Spray? Read on to find out! May this page inspire you to duplicate that exhilarating feeling of the wind in your sails, or at least put a touch of it in your yard, patio, porch or garden with outdoor sailboat decor. To reach a port we must set sail. For the sailing enthusiast, what could be more appropriate than expressing your love of boats and the sea right at your front door? 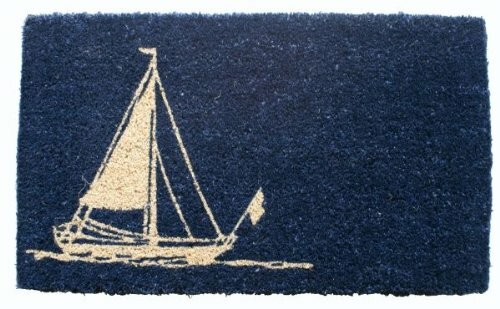 Among the ways to do that are sailing themed welcome mats, door bells, and even welcome signs. 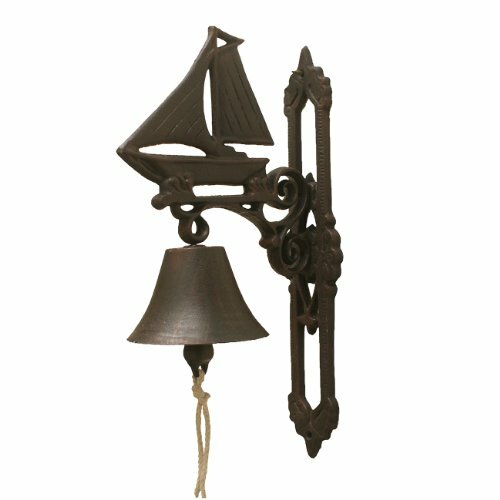 Using a ship's bell for a door bell is a clever, and very nautical addition to any front door, whether you live by the sea, or in a city suburb. There are even mountable bells that incorporate a sloop or other sailing boat into their design. What could be more perfect at the door of a seagoing lady or gentleman? 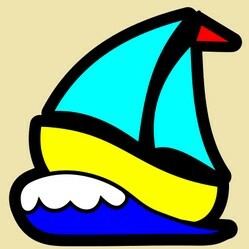 Spray has long been a popular name for sailboats. Do you know why? He sailed around the world, all alone, in a sloop named Spray. "He" was Joshua Slocum. It happened way back in the late 19th century, and his voyage made nautical history. He acquired the boat, at no cost, in 1892. Apparently, she cost him nothing because she was in deplorable condition. After just over a year of hard work, he had made her seaworthy again. It was what he did afterwards that put him and the Spray solidly into the maritime history books: He sailed her - singlehandedly - all the way around the world. He was the first ever to accomplish a solo circumnavigation or the globe in a sailboat. The historic voyage began on April 24, 1895, and concluded on June 27, 1898. He and the Spray had traveled 46,000 miles. Here's a lovely piece of copper garden art that will also show you which way the wind is blowing. Some people also mount this model on a deck railing or fence post. This is a GARDEN weather vane with a stake for securing in the ground, not a rooftop model. It's made to last, of brass and copper. Every patio or deck needs a set of wind chimes. This one is handcrafted deep in the tropics, on the island of Bali, where they know about sailing, and about bamboo, too. The pleasant sound of hand tuned bamboo tubes is, some claim, more relaxing than the tones made by metal wind chimes. I think it's just a personal preference, though, and my preference is definitely for the softer sound of bamboo. THEN: In the late 1800's it took Joshua Slocum just a little over three years to sail the Spray around the world. NOW: Today, astronauts aboard the International Space Station make a full orbit around the earth every 93 minutes! THEN: Our intrepid circumnavigating sailor made his voyage on a vessel measuring 36 feet, 9 inches in length. I can't even imagine the iron will it would take for me to climb aboard a tiny sloop - with no power to rely on than that of the wind - and set out alone to go round the world. . . knowing I wouldn't finish my journey until I was a full three years older. 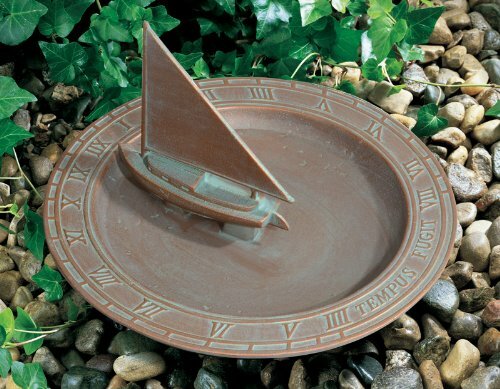 Here's a col piece of sailboat decor for your yard that's used from inside the house, too. 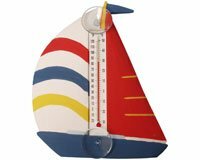 It's an outdoor thermometer in the shape of a boat. Just attach its suction cups to the outside of a window. The temperature shows on the side against the windowpane, so you can check on how hot or cold it is without even going outdoors. It's painted on both sides, so the back lends a decorative element to your outdoor space, too. Hmmm... let me think about it. You bet your boots! Where do I sign up? author, educator, and motivational speaker. Great article to really help you understand how sailboats work - a wealth of information, some of it technical, but presented in a very understandable way, and broken down into logical page sized segments. 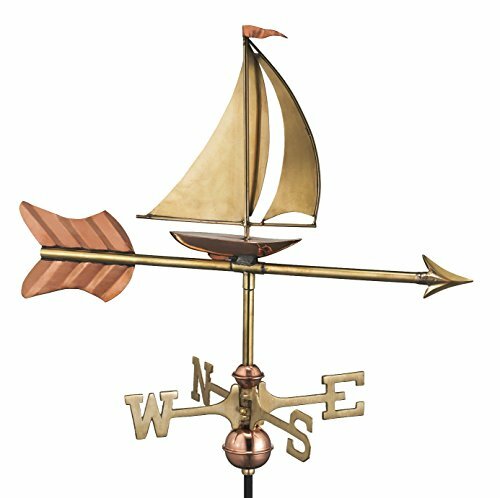 An entire page devoted to sailboat themed timepieces to hand on your wall, and set on your desk, mantle, or shelf, but with some added fun information about wind powered boating. Did you know that NASA's space shuttles were named after historic sailing ships and sail boats? Find out about the sail powered vessels that gave their names to famous spacecraft. Indeed. Indoors or out, or even, as you say, personal items, can all be appealingly done up with some sort of a nautical theme. CruiseReady, It always helps to have a boat or a horse to get something to sell! Nautical decor certainly is attractive for clothing colors and styles too. And to think that one can coordinate personal wear with such personal furnishings as bells, canvases, chimes, and mats! You aren't the only one who was surprised. And it's a very attractive one, too. I have never thought on outdoor wall canvas would be possible, yet you have found one. I love nautical decor, and am constantly on the lookout for it. I love the photos of the boat and cruise, it gels extremely well with the sea and the background. Home decor is one of my favourite topics and nautical decor will look great with blue and pink furnishings. Lots of fun sailing decor here. Thanks! Lighthouse wind chimes and wind spinners make fun and colorful accents for your patio, lawn, or garden. Some may have been inspired by the red and white striped Assateague Light. A rain garden is a plant pond or garden bed used for channeling rain water away from the foundation of the house.